The Chinese-Jewish percussionist found food blog fame in North Dakota. Molly in the kitchen with her mom. 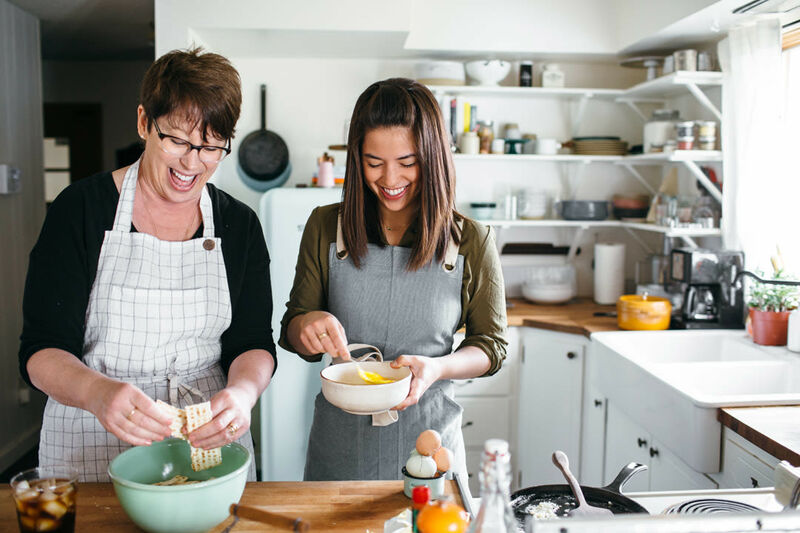 I first heard about Molly Yeh when a colleague brought into the office a pimiento cheese babka she’d made from a blog called My Name is Yeh. I was quickly filled in: Molly Yeh graduated from Juilliard with a degree in percussion (who does that?) and then fell in love with a guy and moved with him to his beet farm in North Dakota (who does that? ), where she got a job at a bakery and then started making her own recipes. She photographed her creations, which went viral on Pinterest and launched her into food blog stardom. Obviously. After I got over my jealousy, I went out and bought her cookbook, Molly on the Range, and asked if she’d like to share some thoughts about being proudly Chinese and Jewish in the Midwest. What are your favorite food traditions from the various cultures in your life — Jewish, Chinese, Midwest farm life? Anything that centers around a dumpling. Matzo balls, potstickers, steamed buns. In my family, we often take the Jewish tradition of eating Chinese food on Christmas to the extreme by throwing a dumpling-making party. Guests come over and roll up their sleeves and fold dumplings, and it’s the best. We do dumplings from all over the world, but most of them are typically pulled from my Chinese roots. This year, however, I’m thinking it’s time to pull from my husband’s Norwegian roots (most of my community here has Norwegian roots) and make a dumpling called potato “klub,” which from what I can tell is a big ball of doughy delicious potato. Do you experience challenging cultural expectations from either side of your family? Not at all, and I think that’s one of the reasons why I am so excited about my cultures now. Both of my parents had a very hands-off approach in introducing me to things like food and music and their respective cultures. They were always super chill, as long as I did my homework. If I wanted to try new things or get into new hobbies, they were supportive, but when I was a picky eater, didn’t want to practice my music, and kicked and screamed on the way to Sunday school, that was all generally OK too, because I think my parents realized that eventually I’d come around. (Which I’m only just now realizing is probably pretty rare for Chinese and Jewish parents?) And now that I have come around to all of these things, I’m grateful that these were all my choices. I don’t have bad memories of being forced to sit at the dinner table until I finished my broccoli or forced to stay in the practice room until I learned a passage of music or forced to go to Hebrew school when all I wanted to do was go ice skating. And, like, I love broccoli and music and I’m starting Hebrew lessons next week! My parents always emphasized that their cultures were super cool, but I wouldn’t say that their expectations were challenging by any means. These days I think I actually place the most amount of pressure on myself to carry on these traditions and cultures. Did you experience any culture shock or negative stereotyping when you moved to the Midwest? When I moved here, it was the first time in my life that I wasn’t around a large Jewish community, which opened my eyes to the fact that not everyone knows what challah is or takes time off of work for the High Holidays. I was also coming from a big city where everyone is meeting new people all the time. So the fact that I was new in a small town and also clearly not of Scandinavian descent (as most people here are) was a bit of a challenge since getting to know people here is a much slower process than it is in a city. But nobody ever showed any negativity toward my differences at all. A lot of people show curiosity about my Jewishness, which is great, because it’s forced me to learn even more about it so I can not look like an idiot when I’m answering a bunch of questions about, say, Sukkot. How do you style your food so nicely? I really love shapes and straight lines and perfect angles, so I just collect tools and tricks that help me achieve those with my food. I have tons of cookie cutters and a really nifty pastry cutter that’s like six pizza cutters attached like an accordion that helps cut bars into perfect rectangles. And I’ll do things like freeze a cake for a few minutes before slicing it to get very clean smooth edges. Little things like that go a long way, and taking the time to do them is what helps me scratch my creative itch. What is the weirdest and best food or flavor combination you’ve discovered? I love chocolate and tahini! And ketchup with basically anything. Click here for three of Molly's recipes just in time for Hanukkah!